I have spindles of many kinds: top whorl, bottom whorl. Russian, Tibetan. Tahkli, Akha. Some are made by skilled spindle makers, others by myself. Some spindles are very dear to me. 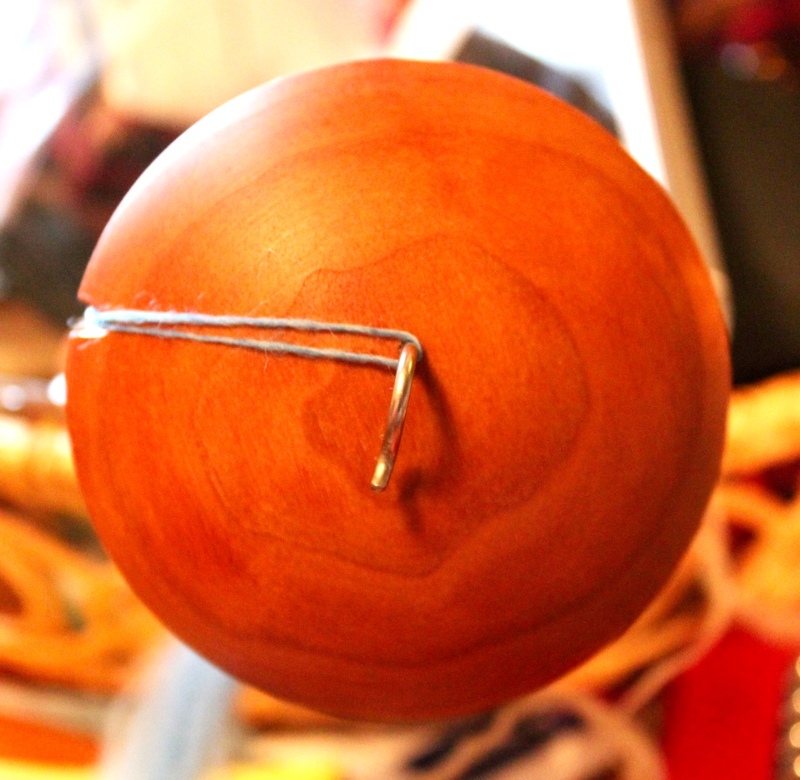 One such is my Maggie spindle from Magpie WoodWorks. It’s beautifully made, and it’s of course a very good tool. I wouldn’t be so fond of it it wasn’t, would I? So I made a container for it. Tapestry crochet, commercial and handspun yarns, some dyed by me. 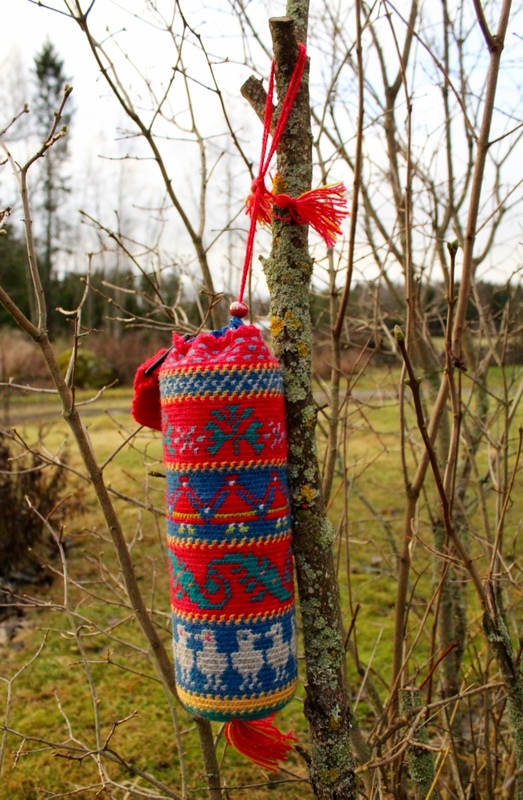 Motives from the Korsnäs sweater, and the traditional birds from some Scandinavian knittings. I put a plastic bottle inside, and a blue cotton lining. Tassels. 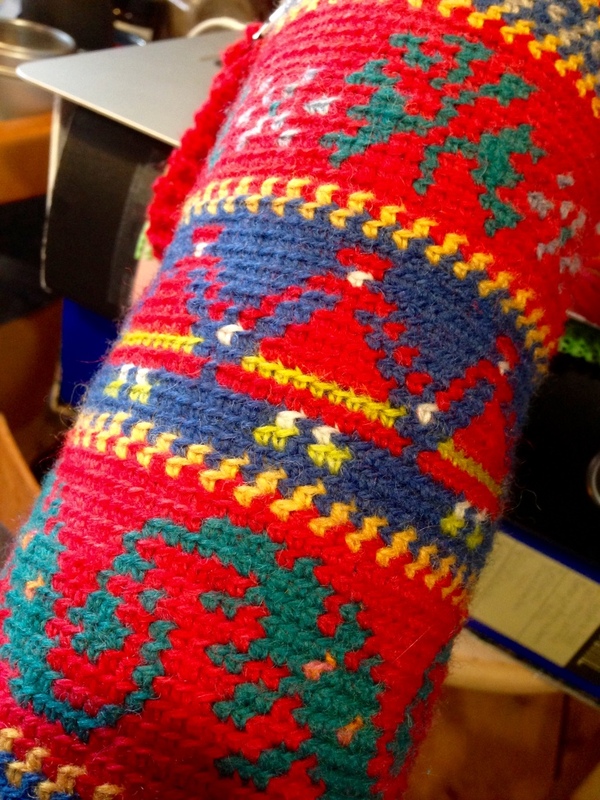 A crocheted wristaff. What an excellent idea! and great execution!! This is beautiful! Funnily enough I made something similar for my Maggie from an old postal tube. I have collaged the outside with a painting my boy did in kinder and some photocopied Victorian etchings I had collected. We Spinners, are a funny sentimental lot moved to make something worthy and protective for our special tools! Precious tools need precious protection 🙂 Would be nice to see your purse! Beautiful!! I, too, would like to see Rebecca’s container. I have a maple Spindolyn and definitely need to make her a fantastic home. All my tools and equipment are lovingly cared for. My first wheel (Louet) is now 45 years old and so pretty because I oil the wood twice a year. Louet has come out with new bobbins with whorls so I treated her to new bobbins this year.